Our company consists of several divisions whose activities extend across a range of businesses, notably wholesale and retail, e-commerce, rental and online marketing. As we are an owner-managed business, our thinking looks towards the sustainable, long-term development of our company for the benefit of our customers, partners and employees. Your rental service for high-end slides scanners, professional super 8 and 8mm film scanners across Europe. Find us at Amazon! There is plenty of choice of bins and collapsible storage containers made in Germany and we provide our demanding customers with industrial grade and sustainability. 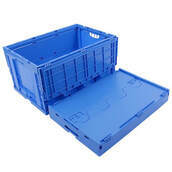 On our Amazon store your will also find plenty of choice of bins and collapsible storage crates with high stability and sustainability made in Germany . We strive for a progressive international expansion and diversification of the Company as well as an ongoing development of the product range. Product design and product development for our private label brands are an increasingly important part of our business. For us, product quality, marketing and free and fast shipment are a matter of course and represent the essentials of our work. We are open for business at any time and wait for the right pitch. We engage in friendly takeovers and prefer asset deals.